It’s Wednesday and that means it’s time for our weekly college football roundtable but we are approaching it a little bit differently this afternoon as we start to dig into individual conferences. TSS Associate Editors Bart Doan and Terry Johnson join staff writer Kevin Causey and special rotating guests in our weekly roundtables discussing all things college football. Last week we talked about the possibility of divisions being abolished and the possibility of UAB football returning. Today we start to dig into the Sun Belt Conference as we are joined by Ben Moore of PantherTalk.com of the 247 Sports Network. Question: Who are the players to watch this year in the Sun Belt Conference? QB Tyler Jones, Texas State – Jones enters his Junior season on a team that’s not only new to the Sun Belt but new to FBS. He had a tremendous 2014 throwing for 2670 yards and 22 TDs while completing 65% of his passes through the air and rushing for another 539 yards and 6 TDs on the ground in leading the Bobcats to a 7-5 season. Jones has a shot to really boost his stats this Fall and be in contention for All-Sun Belt first team honors in a year that’s very strong at the Quarterback position in the league with Kevin Ellison, Nick Arbuckle, Cody Clements, Taylor Lamb and Tyler Rogers all set to put up big numbers. Matthew Linehan, QB, Idaho: It’s hard not to like Linehan, a sophomore quarterback, when he has 140 characters to put in his profile on his Twitter and complains about the lost art of the mid range jump shot. He probably needs to complain about the lack of movement without the ball, but that’s a column for another day. At any rate, Paul Petrino has infused Idaho with new hope, if not a bunch of JUCO players set to make an immediate impact (hopefully) in the win column. But a lot rides on Linehan, because the quarterback position in college football is as important as it is, and Linehan can grow into a star at the position, only a sophomore. His progression will determine how far Idaho will improve on the offensive end, and if the Kibbie Dome lights of bowl fireworks this year. No pressure. And hit your 15-footers. As a sophomore and first year starter, Ellison led Georgia Southern to a record of 9-3. What’s more impressive about that is it was Southern’s first year in the FBS and they went 8-0 against Sun Belt opponents. Running the Georgia Southern offense it’s a given that Ellison is a dual threat. In 2014, he ran for over 1,000 yards and 12 TDs and he also passed for over 1,000 yards. With a year of experience under his belt, how good will Ellison and the Georgia Southern offense be in 2015? 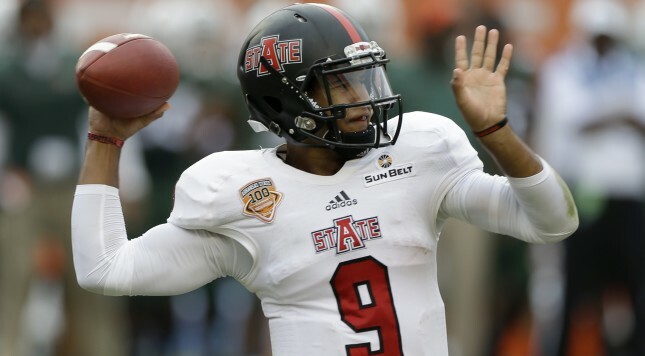 The player that I’m keeping an eye on is Arkansas State’s Fredi Knighten. Make no mistake about it: Knighten is one of the top quarterbacks in college football (regardless of what Phil Steele’s magazine says). He quietly put together a fantastic season in 2014, ranking 12th nationally in total offense, accounting for more yardage than Jameis Winston, Bryce Petty, and Brett Hundley did last year. What makes Knighten such a joy to watch – and a nightmare for opposing coordinators to defend – is that he’s so versatile. He’s a dangerous runner, breaking at least one run of 20 yards or more in eight of the Red Wolves’ 13 games last season. However, he’s also a very efficient passer, completing 62.3% of his throws with a very respectable 24/7 TD-to-INT. With nine starters returning from last year’s squad, expect to see those numbers increase this fall.